Polar Bear Oreo Cookies are so cute, they're un-bear-able! (Pause for groans.) Cheap wordplay aside, these cookies might be the best thing to happen to Oreos since the invention of cream filling. It only takes a few minutes and a few ingredients to transform white chocolate-dipped cookies into cuddly polar bears or cute paw prints. These would be perfect at any animal- or winter-themed party! Line a baking sheet with waxed paper or parchment paper, and set aside for now. Place 16 oz white candy coating in a medium microwave-safe bowl. Microwave in 30-second increments, stirring after every 30 seconds to prevent overheating, until the coating is melted and smooth. Using forks or dipping tools, dip a cookie in the coating until it's covered completely. Remove it from the coating and let the excess drip back into the bowl, then place it onto a baking sheet lined with parchment or waxed paper. 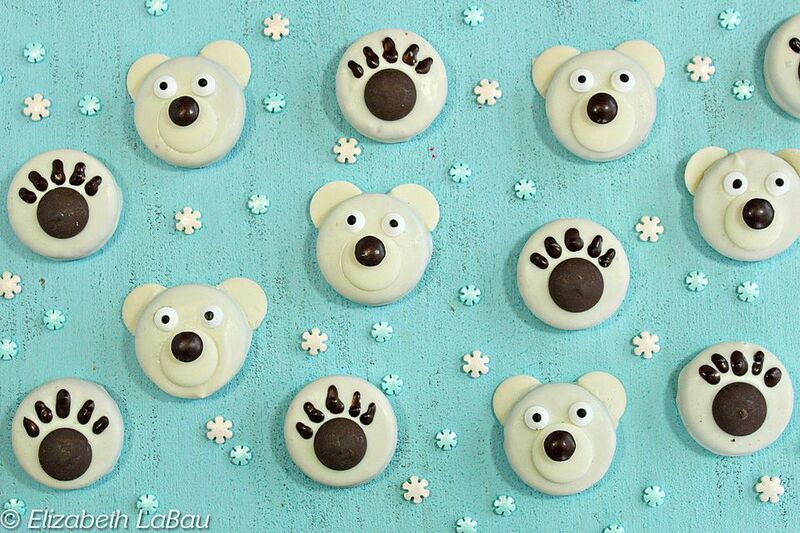 Make the polar bear or paw print designs while the chocolate is still wet. To make a polar bear, cut a white candy coating wafer in half, and press the two halves against the base of the cookie at the top to represent the ears. Stick an additional wafer on front of the cookie for the bear's muzzle. Press two candy eyeballs into the cookie. Finish by dipping the bottom of an M&M into the coating, and pressing it onto the muzzle to be the nose. To make the paw prints, melt 1/4 cup of dark coating and place it in a paper cone or a plastic bag with a hole snipped in the corner. Press a chocolate wafer into the center of the cookie while the coating is still wet. Draw 5 lines above the wafer to represent the claw marks. Refrigerate the tray to let the cookies set completely, for about 15-20 minutes. Store these Polar Bear Oreo Cookies in an airtight container at room temperature for up to two weeks. Note: If you don't have candy eyeballs, you can easily substitute white chocolate chips for the eyes. Add a small dot of melted dark chocolate to the center of each chip once you place it on the face, and they'll look just like eyes! Click Here to View All Cookie-Based Candies!